Seville is a Spanish city with a great culture and many places to visit. In Seville we highlight the district of Santa Cruz, a the typical Andalusian neighbourhood with plants and flowers and beautiful houses; and the famous Cathedral of Seville, the largest Gothic cathedral in the world and which is built on an ancient mosque, of which is only left its minaret, known today as the Giralda. Getting to Seville from Malaga is easy if we choose to book a tour or a minibus. The guided tour includes travel by bus with air conditioning or heating depending on the time of year when we travel to this city. The price of the trip to Seville is 45 € and its duration is 1 day, with weekly departures from Malaga on Wednesdays and Fridays in high season. 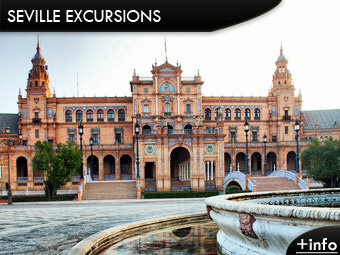 What is included in the excursion to Seville? The tour includes a visit to Seville to its great monuments, and a local guide. Lunch is optional but recommended, after which you have free time for shopping or walking, and later return to the point of collection. The excursion to Seville includes compulsory travel insurance, tour guide who speaks several languages and tickets to the cathedral of Seville. Do not forget that businesses in Spain are usually closed from 2 pm to 5 pm. If you plan on going during the winter do not forget to bring warm clothes. During the summer wear light clothes and if possible both sunglasses and a cap. Seville is one of the hottest cities in Andalucia during the summer. The use of footwear and comfortable clothing is always recommended, do not forget. Where can I book an excursion or tour to Seville? We recommend to book your trip to Seville in advance to avoid availability problems. Transfer Malaga airport to Seville: For you, your family or a group of people. Check prices and different options from Malaga airport.